After taking almost a year off from astrophotography I decided to revisit some of the image data I collected in 2014 but never processed. The image presented here is NGC 7635 otherwise known as the Bubble Nebula (for obvious reasons). 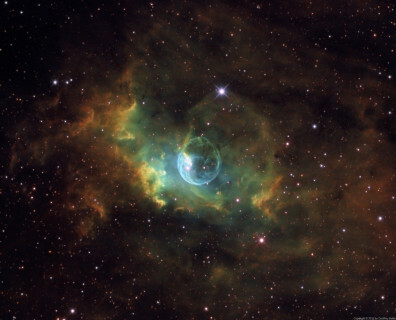 You can read more about the Bubble Nebula in the wikipedia article. Over 35 hours of starlight exposures went into this project. 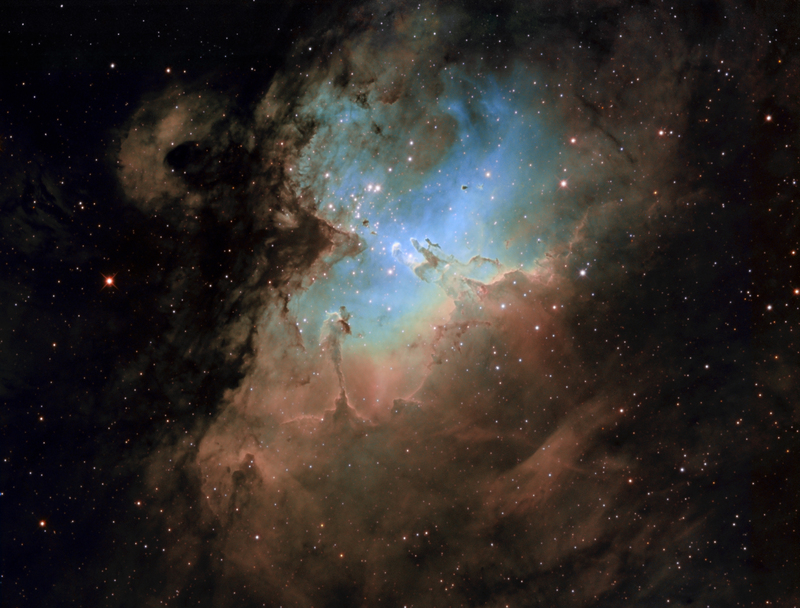 I recently learned that my astrophoto of M16 (aka The Eagle Nebula) will appear in Sky and Telescope magazine’s May issue! I’m told that the image will appear in the gallery section and will be about a half-page in size. Getting an image published in Sky and Telescope is one of the top honors for an amateur astrophotographer, so I was pretty thrilled to hear the news. Since they will be paying me $50 for the image perhaps I can now say that I’m a “pro astrophotographer”? To the left and down from the pillars is located a fantastic stellar spire. As with the pillars, this area is also a likely star forming region. Over 20 hours of starlight exposures went into this project. I also spent some time today reprocessing a set of data from 2011. 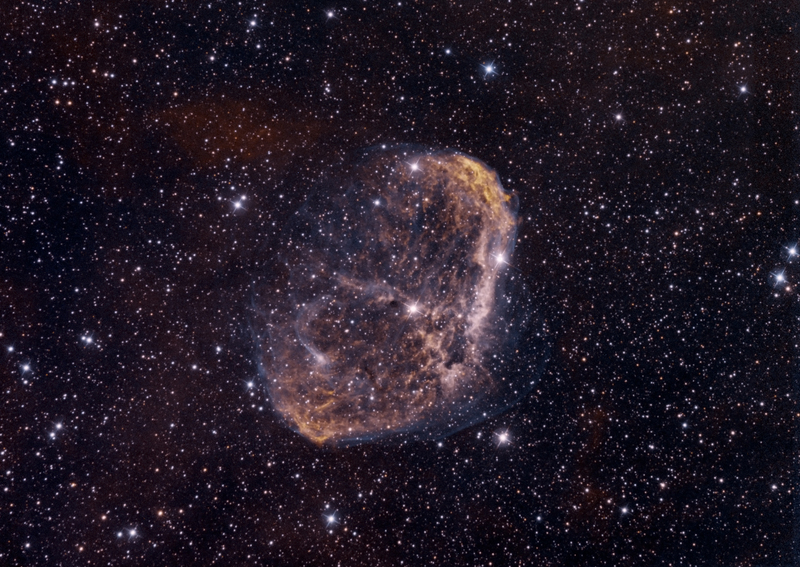 Below you will find a completely new processing of NGC6888 (The Crescent Nebula), using LRD fat tail deconvolution for sharpening. After nearly a year since our last post, I’m happy to be able to present our biggest project of the summer! 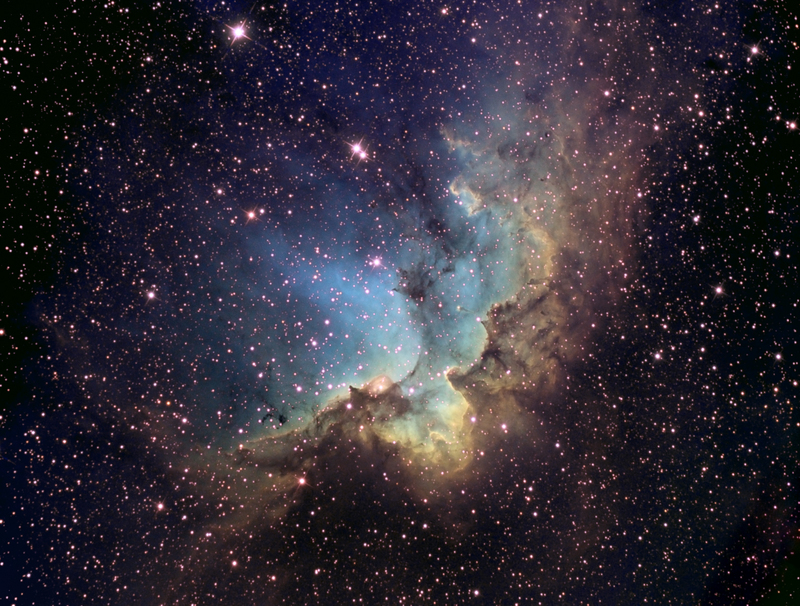 Back in 2011, one of the very first narrowband subjects I attempted was NGC 7380 – aka The Wizard nebula. Unfortunately there were a number of problems with that original dataset, and I had always wanted to give it another try. Presented here are the results of that effort. Over 39 hours of starlight exposures went into this project. Here is Seattle we usually have few opportunities in winter to do deep sky astrophotography. Fortunately I still have some sets of unprocessed data which I saved from the summer months. This weekend I finally got around to processing one of the sets. 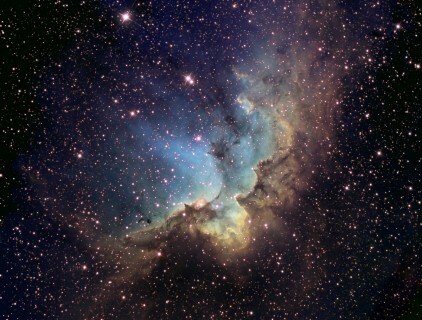 The image you see here is that of IC 1795. 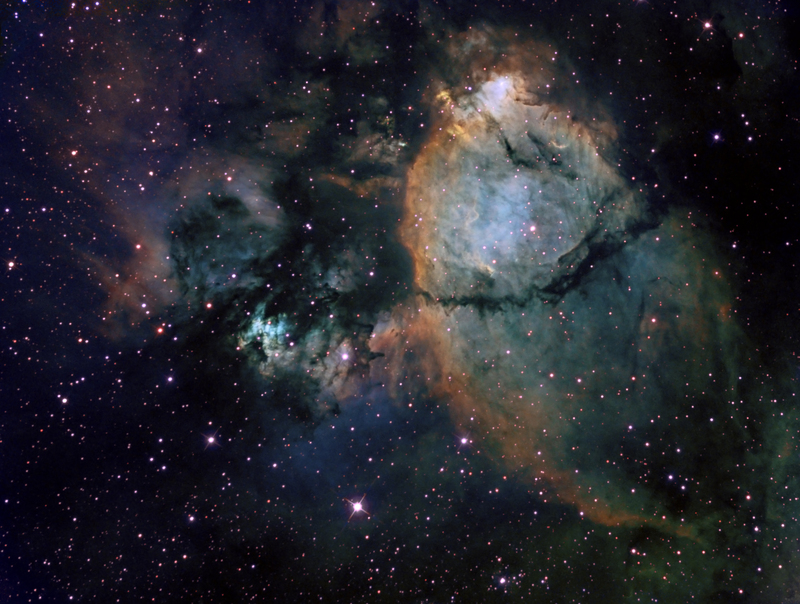 It is a star forming region near the much larger Heart Nebula, also known as IC 1805. 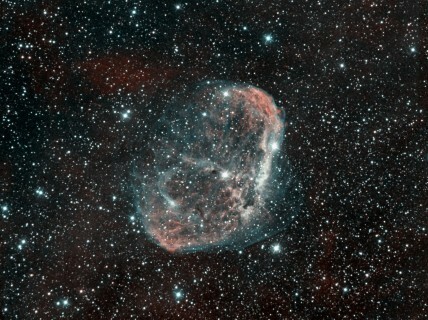 This is a false-color composite of narrowband (HA, OIII, SII) images taken between 8/31/2011 and 9/8/2011. This particular arrangement of colors was originally used for Hubble space telescope photos and is therefore known as the Hubble Palette. After several weeks I was finally able to finish image processing for some narrowband captures I did in early September. 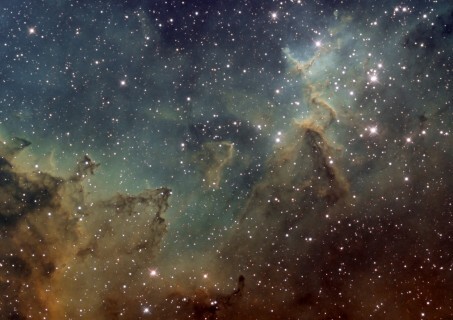 This image is the center region of the Heart Nebula. The center region (the bright part in the image) is known as NGC 896, and the Heart Nebula is known as IC 1805. “The Heart Nebula, IC 1805, Sh2-190, lies some 7500 light years away from Earth and is located in the Perseus Arm of the Galaxy in the constellation Cassiopeia. This is an emission nebula showing glowing gas and darker dust lanes. The nebula is formed by plasma of ionized hydrogen and free electrons. Frames for this image were taken from Seattle Washington over the course of seven nights, between September 9th and September 24th. As I did not like the color set with the Hubble Palette for this image (it had a nasty green shade to it) I have opted for the popular gold/teal motif. Hubble palette converted to Gold/Teal motif using this technique. This final image contains over 15 hours of exposures. This is my rendition of NGC 6888, also known as The Crescent Nebula. It is an emission nebula in the constellation Cygnus. While it looks like a supernova remnant, it is actually a planetary nebula. (from wikipedia) It is formed by the fast stellar wind from the Wolf-Rayet star WR 136 (HD 192163) colliding with and energizing the slower moving wind ejected by the star when it became a red giant around 400,000 years ago. The result of the collision is a shell and two shock waves, one moving outward and one moving inward. 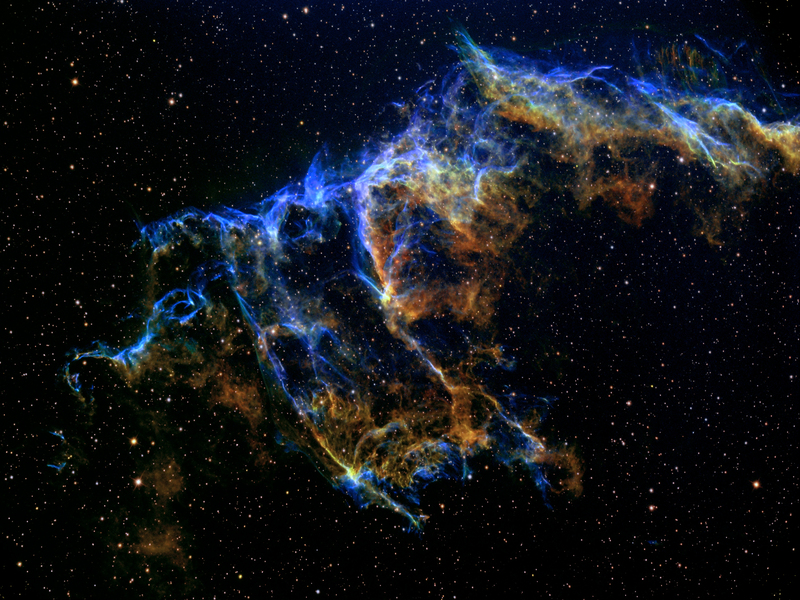 The inward moving shock wave heats the stellar wind to X-ray-emitting temperatures. I had a really hard time processing this one, and I’m still not completely satisfied with the result. I’m using 8nm Baader filters and I’m imaging from near downtown Seattle, with all the associated light pollution. Not sure if tighter bandpass Astrodon filters might help improve SNR on this subject. Over 15 hours of exposure time went into creating this image. That’s actually just counting the images that went into the final product. Many more hours of images were not used due to various defects. Some nice clear August skies have made it possible to do some great narrowband imaging, and today I have finished processing what took four nights of imaging to record. With over 11 hours of total exposure time, it is my most extensive attempt at narrowband imaging to date. In fact, I’m pretty certain it is the longest amount of total exposure time I’ve ever put into a single target. 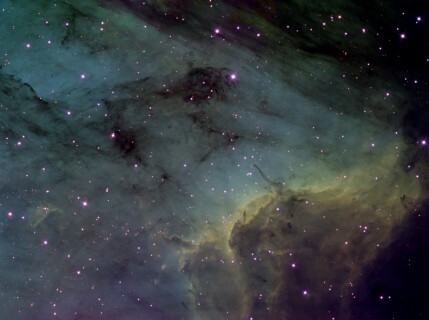 The image below is that of the ionization wavefront region of the Pelican Nebula. Also known as IC 5070 it is an active star forming region that has been extensively studied (click here for wikipedia page). You may recall that I previously imaged this region in 2008 from the dark skies of the Table Mountain star party using a modified digital SLR camera. You can see that earlier image here. When compared to the detail and color of today’s image the benefits of the narrowband technique becomes clear. Imaging that was once only possible at remote locations can now be surpassed from light-polluted downtown Seattle. In addition to the using new hardware, I have also spent many hours studying online tutorials on the topic of image processing. Tutorials that I have found useful include those by Astrodon Imaging, Misti Mountain Observatory and a few others. These techniques have enabled me to maximize the already great narrowband dataset.